In today's fast moving and technological environment we are finding more and more ways of storing our personal data and taking it with us on the move. In so far as this can be advantageous if we need to call on such information at a moment's notice it can also be dangerous if such information falls into the hands of those who wish to use it for purposes other than those it was originally designed for. A Personal Digital Assistant is often referred to as a PDA or a handheld computer. These small devices, sometimes no larger in size to a mobile telephone, can hold vast amounts of data and call also send and receive emails as well as performing tasks such as word processing, producing spreadsheets and allowing their users to have organiser facilities at the touch of a screen. When PDAs first entered the marketplace they were rather cumbersome devices and the notion was they would not catch on however some ten years later they are as much a part of business and personal life as the mobile telephone itself. Indeed one such forerunner is the Blackberry which is both PDA and mobile telephone combined allowing the user the freedom to make and receive calls on the move and also make and receive electronic mails as well. Whilst using a PDA (Personal Digital Assistant) you are likely to input or email information of a personal nature as you would with a home computer or laptop. For this reason it is of the utmost importance that such information is kept safe and made as difficult to access as possible for any would-be thief. If you must email using your PDA then you should always make a point of deleting your electronic mails once they have been sent. This can be done very easily and if your PDA is set up to use an email account that you can also access in your office or home then copies of these mails will be accessible there after they have been deleted from your PDA. It is important that where possible you do not leave or use bank details via your PDA and if you must ensure that they are removed as soon as they are finished with. 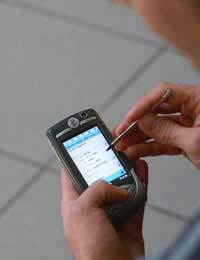 Most PDAs use a standard language - or code - to operate the applications installed on them. For the most part these applications will be derivatives of Microsoft's Windows platform packages such as Microsoft Word, Microsoft Excel and Microsoft Outlook. These packages all come with an industry standard password protect function allowing you to attach passwords to your important files thus making more difficult to hack into should your PDA fall into the wrong hands. It is a must that if you have to keep sensitive information on your PDA that you password protect the files in which this information is stored. As the technology we are discussing progresses so does it's applications and one of the newest features of these PDAs is wireless connectivity. Just as you connect to the Internet in your office or home using wireless technology so to can PDAs in so-called 'hot spots' - these are areas specifically open to the accessing of Wi-Fi Internet such as Internet Cafes. You should be aware that identity thieves are now as technical as their victims and as such you are vulnerable to having your data downloaded or hacked if you use such a 'hot spot' without the correct encryption in place. Most Wi-Fi technology allows for standard WPA or WEP encryption which requires passwords containing either digits or alpha-numeric combinations. It is important to have your wireless Internet connection protected using one of these two industry standards in order to avoid unauthorised access. PDA - Put it Away! It is important that if you do carry such a device you do so about your person in a pocket that is difficult to get at. Do not leave such equipment visible in your car should you be leaving your car parked for any length of time and never allow anyone to use your PDA if there is a chance you may be out of their sight for any length of time. Likewise it is important to clear off any important files once they are finished with and also to ensure that memory cards are also wiped clean.